Dealing with a slip and fall accident while walking or shoping can cause a lot of embarrassment and pain. You might be confused on your rights as a victim of a negligent person or store. Learn what you need to know if you have been injured with our New York Slip and Fall Accident Guide created by our Personal Injury Attorneys in Buffalo NY. If you slip and fall, you may be feeling angry about the injury you have sustained. The anger may stem from the fact that this injury could have been avoidable. Many slip and fall cases happen because of someone else’s negligence of property. These injuries can include falling on ice, worn down steps, faulty hand rails, etc. They can cause you worry about how you are going to manage things financially. Each year, slip and fall incidents lead to approximately 300,000 disabling injuries and 17,000 accidental deaths. Many of those occur because of lack of care on the part of a property owner or manager. To be successful with an injury claim, your attorney must prove that an unsafe condition existed on the premises; that the owner or manager either created the condition or should have known that the condition existed; and that, even though there was enough time to act, no one posted proper warning signs or repaired the condition in time. There are many causes of a slip and fall injury, such as ice or snow on sidewalks and entranceways, faulty railings, debris, or equipment left out on a construction site, unexpected changes in floor level, and poor lighting conditions. Many issues require attention in slip and fall cases due to ice or snow. The most important factor is the climate conditions that were present at the time that the injured party slipped and fell. It is the responsibility of the attorney to determine whether these conditions were brief and temporary or if they lasted for a prolonged period. As in all liability cases, the property owner or individual responsible for the premises must be shown to have known about the dangerous conditions prior to the incident. Your attorney will hire experts to testify how long these hazardous conditions had been in place in order to prove the property owner’s inaction. For instance, slip and fall injuries can occur when an individual tries to use a hand rail that is loose or defective and does not provide the necessary amount of stabilization. In these situations, it must be demonstrated that the property owner or manager knew about the defective condition. Interviewing prior renters of the property and hiring experts to show decay in the hand railings are two ways to assign culpability where it is due. Tripping hazards such as cables, wires, poles, natural hazards, roots, and fallen tree branches can cause serious injuries. A tripping hazard entails any type of structure or item that is not in its normal location, whether the hazard is unusually elevated, seeping out of the ground, on a construction site, or even stacked in a private residence. Those who suffer injuries from tripping over one of these hazards can file claims to help pay for their injury-related medical bills. Here at Andrews, Bernstein, Maranto & Nicotra PLLC, we take slip and fall cases seriously, and we represent many people injured because of others’ negligence. We strive to get fair monetary compensation for every client injured by these preventable incidents. One of the biggest case mistakes in slip and fall claims comes down to an injured person forgetting to take photos. When you’re injured, and you fall, you’re often embarrassed. The biggest mistake they make is not documenting by way of photos that dangerous condition they fell upon. For example, if it was a large puddle of water, or if something was spilled, or if a carpet was overturned, getting that in a photograph to show why they fell is critically important to the case. Another thing that they fail to do is to request a copy of the incident report or give a statement when they should have talked to their attorney first. The third mistake with slip and fall cases comes down to not get names and phone numbers of people who may have seen them fall. Those witnesses can be critically important to winning any slip and fall case. Being confronted with a tripping hazard during dangerous conditions can cause very serious injuries. There can be things such as cables, wires, poles, natural hazards, roots, fallen tree branches, etc. Tripping hazards are most often man-made, some are created, and some accrue overtime. For example, water seepage over a sidewalk that lifts to a condition where it’s dangerous. You can have structures that have shifted because of freezing and thawing. A tripping hazard in general is any type of structure or item that is not where it’s supposed to be, either it’s elevated, seeping out of the ground, on a constructions site, or even at a home in the backyard. What Should I Do if I Slip and Fall on a Residential or Business Property? If you slip and fall on a commercial or residential property, their insurance allows you to be compensated for any injuries you might sustain. This is called a general proposition premise liability case. In a slip and fall case, your attorney must show that the person responsible for taking care of the property did not. The first thing that needs to be show is that the individual knew there was a defective condition on the property and failed to fix it. The other thing that can be shown is that they knew that there was a defect in the property, and the defect existed for a period. It all comes down to the credibility of the person who’s making the claim, but also a combination of how the story fits in with what the physical structures look like that may have been a cause of that fall. Your attorney should look for any possible witnesses in the area, take photos of the area where it happened, and look for any video surveillance or safety cameras that are around. It’s common to have private homes to have their own security system. There are cases and laws on point regarding the obligations of the premises owner, but also protections regarding what they are obligated to do. If there’s a storm in progress, depending on the severity of the snowfall and the duration of the storm, it can temporarily alleviate certain duties of a premises owner while that storm is in progress. Most municipalities do not impose a duty upon the homeowners to clear snow. However, once a homeowner undertakes that task, and they begin to do the snow removal, they must do so in a non-negligent manner. They can’t just leave a sheet of ice after removing the snow because often the snow provides traction to people walking on it. If a homeowner does shovel their sidewalk or doesn’t maintain it properly, and they create an icy condition based upon their actions, then you would certainly have a potential claim. There can be many different people or entities that may be involved or liable if there’s a dangerous condition that’s not maintained around a bus stops. The bus company has a responsibility to maintain those structures. Depending on where the incident may occur, the city or town may also have some responsibility if they may have cleared the ice or snow in a negligent manner. Once somebody takes affirmative action to take steps towards remedying a situation like snow accumulation, they must do so in a non-negligent manner. If there’s an ice buildup there, either by way of poor drainage, improper drainage, or if there was improper snow removal that was done that caused a very icy, slick surface for an area where they know that customers or pedestrians are going to be waiting, then there’s potential liability there. What Should I Know if I Fall and Get Injured Due to a Faulty Hand Rail? Hand railings are put into place to provide stabilization for people who are using stairways. When someone trips and uses a hand rail that is loose or defective, the hand rail will not provide stability and causes the person to fall. In those situations, your attorney needs to show that the owner of the premises or the person responsible for the premises should have known of the defective condition. The other issue in respect to hand rails is when there is no hand rail there at all. Certain codes in states, towns, cities require that there’d be hand railings in certain situations. If those hand railings are not put into place then its evidence of negligence on behalf of the owner of the premises. Does a Warning Sign Prevent a Slip and Fall Claim? Putting up a warning sign alone does not wipe out a landowner’s responsibility to be careful and to not be negligent to others that are either passing by or passing through. If somebody enters a property and falls into a condition that is dangerous, because the sign was not visible, then that warning sign would have no bearing. 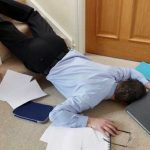 Warning signs alone are one factor to consider to your case but are not determinative in and of themselves of negligence regarding the happening of a fall. If you have been seriously injured in a slip and fall accident, it’s important to seek legal representation as soon as possible. Contact Andrews, Bernstein, Maranto & Nicotra PLLC for a free consultation. Our team of skilled attorneys will fight to get the compensation that you deserve. The personal injury attorneys at Andrews, Bernstein, Maranto & Nicotra PLLC have achieved outstanding results in their representation of slip and fall victims. Our personal injury firm has the skills and experience to negotiate with insurance companies and challenge these companies’ attempts to downplay the extent of your injuries. We are trial-ready and prepared to aggressively pursue and achieve our clients’ ideal outcomes in the courtroom. We will assess the full extent of your damages and aggressively litigate when necessary to make sure that you and your family are fully compensated for your injuries. Never settle for less, find out what your case is worth!